The indicator shows the development of tourism in Slovenia with the trends in the number of available beds and the number of overnight stays of tourists, as well as their temporal and spatial distribution, primarily with regard to proximity of protected areas. In the section entitled Tourism, the National Environmental Action Programme envisages directing practices towards the development of sustainable forms of tourism. These would ensure sound utilization of space as well as environment-friendly activities, facilities and the development of tourism supply which will take great consideration of natural and cultural identities in marketing. The National Environmental Action Programme considers management of mass tourism as one of most essential measures in the area of environmental protection wherever the latter might cause unacceptable degradation of the environment. Following the drop in the number of tourists and tourist capacity in Slovenia in the wake of the Independence War, tourism has been steadily regaining momentum since 1992 in respect of the number of available beds and, in particular, in respect of the number of overnight stays. In 2006, there were 7.722.267 overnight stays in 80737 beds meaning that, on average, beds were occupied for a quarter of the year (i.e. 96 nights). 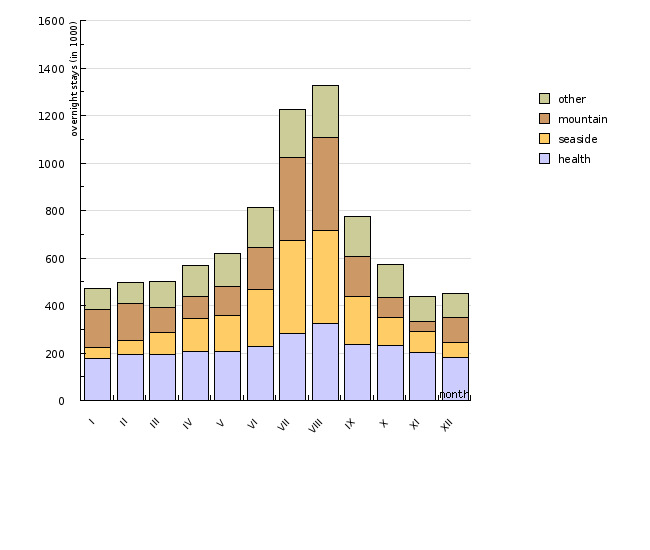 The distribution of overnight stays throughout the year however, shows that tourist bed occupancy rates were highest during summer months, when the majority of tourists visit seaside tourist resorts (in July 2006, a little more than one third of total overnight stays was recorded in seaside tourist resorts), with a little smaller share visiting mountain and health resorts. Increased occupancy of existing tourist accommodation facilities entails a reduced spatial burden but, at the same time, a greater burden on natural resources. The latter especially poses a major problem at the peak of the summer tourist season. Environmental pressures, increased by tourism development, is caused principally by the rise in quantities of drinking water consumption, waste water and solid waste, the burden on utilisation of land intended for tourist facilities, as well as gas emissions and other pressures arising from tourism-related transport operations. The relationship between the great biodiversity of many Slovenian regions, which accompanied by the concept of “natural beauties”, constitutes one of the prime components of Slovenian tourist supply, and the stresses exerted by tourism industry on natural beauties, especially in sensitive habitat types such as, e.g. karst caves or areas where disturbance sensitive species breed is particularly vulnerable. Spatial distribution of the principal Slovenian tourist resorts clearly shows the importance of such interdependence with the majority of larger tourist resorts lying in the vicinity rather than within protected environmental areas, indicating the importance of environmental protection also for future tourism development. The data used have been issued by the Statistical Office of the Republic of Slovenia, published in Statistical Yearbooks of the Republic of Slovenia. 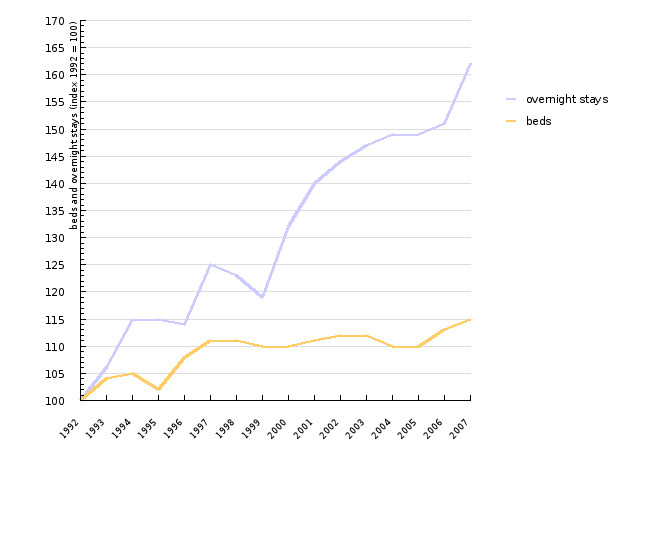 Data on capacities of tourist accommodation facilities (number of rooms and beds) and on tourist arrivals and overnight stays are reported monthly to the Statistical Office of the Republic of Slovenia by companies and other organisations providing accommodation to tourists or providing such services as an agency, as well as individuals who let private rooms. The data are based on total coverage. An overnight stay is every night that a tourist actually spends (sleeps or stays) or is registered (his/her physical presence there not being necessary) in an accommodation establishment. -	has reception facilities (accommodation establishments with accompanying trade, crafts and postal services as well as parks, promenades and bathing facilities, etc.). -	other tourist resorts (i.e. places with particularly attractive elements, e.g. climate conditions, cultural or historical monuments, etc., riverside and lakeside areas and other places that cannot be classified among any of the above mentioned places, and the Slovenian capital – Ljubljana). Data regarding protected natural areas nature derive from the Register of protected areas, Environmental Agency of the Republic of Slovenia, and are taken from the Collection of digital maps and raster base maps, Environmental Agency of the Republic of Slovenia.